There’s nothing quite like the feeling of waking up after a good night’s sleep, feeling alert and refreshed. Unfortunately, for many seniors, a good night’s sleep is just an elusive dream! According to one study, insomnia affects almost half of people over 60. If you or someone you love has insomnia, you know what an effect it can have on day to day life. Not getting enough sleep makes it harder to concentrate or stay alert, and it can also impact your mood. Sleep deprivation has long term health effects as well. People who don’t get enough sleep have a higher risk of high blood pressure, heart disease, diabetes, depression, and stroke. If falling asleep and staying asleep is an issue, it’s important to talk to your doctor. There are many reasons why you may have trouble sleeping, ranging from anxiety or pain to side effects of medications. Narrowing down the root cause of your sleepless nights is an important step in finding the right treatment. 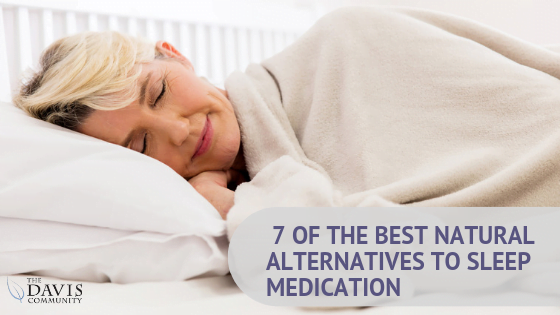 Many people prefer to try natural alternatives to sleep medications. If you are pursuing natural treatment methods, you need to keep your doctor informed. Even natural remedies can have an impact on other areas of your health. Are you looking for natural remedies for insomnia? Depending on what’s causing your insomnia, you may want to discuss one of the following options with your doctor. It could be your key to a good night’s rest! Many herbs can be used to treat insomnia. Here are a few of the more popular herbal remedies. Lavender. Lavender oil is frequently used in aromatherapy and can be effective in improving quality of sleep. Valerian. Valerian can be taken as a supplement and increases the brain’s level of the calming chemical GABA. Chamomile. Chamomile tea is a popular remedy for insomnia. If you suffer from allergies to plants or pollen, though, use it with care. Some people find that it can aggravate these allergies. Passionflower. Passionflower is another popular herb that can be used in tea form to fight insomnia. Other herbs that may be effective in treating insomnia include lemon balm and ginkgo biloba. Before you begin using any herbal remedy, make sure to consult with your doctor. Some herbs can interact with certain medications. Melatonin is a hormone that your body produces to signal your brain that it’s time to sleep. Levels of melatonin rise naturally in the evening and fall again in the morning. Melatonin has been used to treat people suffering from temporary sleep disruptions, such as jet lag or shift work. Some people also find that taking a melatonin supplement in the evening can help them to fall asleep more quickly. It may also increase the total amount of sleep time. Magnesium is a mineral that plays an important role in your overall health. It also has an effect on your sleep. Magnesium regulates melatonin, as well as neurotransmitters that are responsible for calming your body and your mind. Insufficient magnesium intake has been linked to sleep problems. You can increase the magnesium in your diet by eating more green vegetables, nuts, cereals, meats, and fruit. If you feel you need more than what you are taking in through food, it’s important to talk to your doctor before taking any supplements. Magnesium supplements can interfere with certain medications and may also lead to side effects like nausea, cramps, or diarrhea. A consistent exercise routine has been linked to better overall sleep. It’s best not to exercise too close to bedtime, though, since that may stimulate you and make it more difficult to wind down for the night. Experts recommend not exercising for at least three or four hours before you plan to go to sleep. Acupuncture is a traditional Chinese treatment that involves inserting very fine, sterilized needles into specific acupressure points that can influence certain functions of the body. For people with insomnia, acupuncture may improve sleep quality, and it can also be effective in treating sleep apnea. If you are considering acupuncture, it’s best to ask for your doctor’s recommendations. Avoid napping late in the day. Do something to relax before bed. This could include reading a book, taking a bath, or listening to music. If you choose to read, don’t use an e-book or a phone. Using these devices right before bed can make it harder to fall asleep. Meditation or mindfulness activities can also help to calm you and take your mind off of the stresses of the day. Don’t eat a heavy meal late in the day. Some people do find, however, that they sleep better if they have a light snack before bed. Your environment can play a role in how well you sleep. Here are a few suggestions to set yourself up for the most restful night possible. Remove TV’s or computers from the bedroom. Keep it dark. Room darkening shades or a sleep mask may help to block light that could wake you too early. Run a fan or a white noise machine to mask sounds that could disturb your sleep. Keep your bedroom at the right temperature. In general, temperatures between 60 and 67 degrees are considered ideal for sleeping. We all need and deserve a good night’s sleep. Natural remedies used in combination with good sleep habits may be the key to getting the sleep you need. This entry was posted in Assisted Living, Senior Tips. Bookmark the permalink.